The agile mindset and a corporate culture emerge from the behavior of people who do the work. Agile transformation begins with the individual. 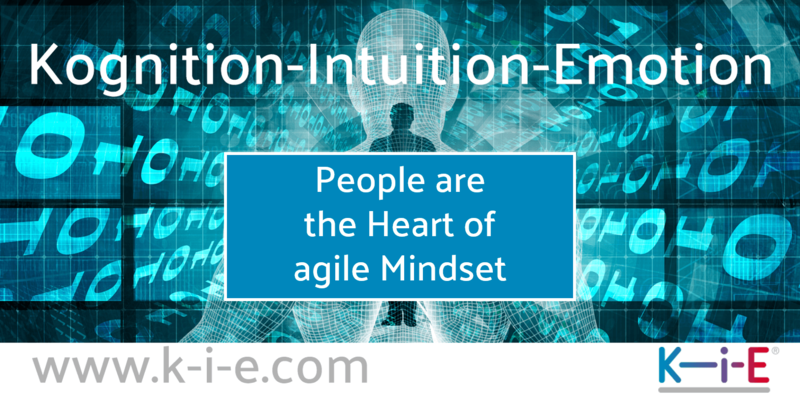 Agile Mindset brings people into the centre of agile transformation. Decision-making processes bring people back at the centre, because they involve each individual with their diversity in a secure and open order. Agility actually empowers people with the flexibility to act in the dynamics of today's globalized world and to respond to disruptive changes. Companies develop agility with the people who want and are allowed to belong. How do Values develop for the agile Mindset? People live a culture. So companies don't really own "a culture" nor do they have values. Culture arises when people behave according to certain values. To do this, the individual people who do the work must be empowered. Even more, it must be possible for people to interact with each other according to values. People should get a chance to do well. If someone shows up at the Daily Stand-up and is devalued, eye level is lost. The same applies if an employee in the traditional area is criticized by his or her manager as soon as he or she openly talks about defects. Then openness and courage are guaranteed to be lost. For values to establish themselves, they must be embedded in practicable processes that continuously and reliably produce good results. Decision-making processes and consequently agile methods are predestined for this. If people want to work openly with focus at eye level, this first requires a decision-making process that involves everyone and respectfully commits them to their duties, so that the competencies flow into a jointly supported decision. Decision-making processes ensure this reliably. The values must therefore be anchored in the process, which is largely guaranteed for decision-making processes that are based on the inseparability of emotions, intuition and cognition, as well as for most agile methods. The belief that agile values would spread from the agile teams into the traditional areas of the company is an illusion. Neither can values be given in top-down processes without introducing agile methods that standardize how we deal with each other. Rather, agile methods are usually weakened and devalued. A top-down approach requires a commitment process - especially in management - so that lip service becomes real support. A change in values will establish itself with lived successful experience with employees, managers and all participants. Corporate reality shows that transformation is showing to be a difficult process. So far, better results have seldom been achieved and the desired flexibility is not achieved immediately. The painful reality is that most transformations fail. McKinsey reports in its studies that 70 percent of large-scale change programs fail to achieve their goals. The agile methods have provided groundbreaking agility, especially in the implementation areas. There are enough key figures available to show what can be achieved. Now all divisions rightly want to achieve flexibility and implementation competence. Digitalization converts or creates new digital services that replace classical business processes and were previously executed by humans. If ticket sales in shop systems performed by people are converted into an app, then that is 100% digitization. The Amazon order dialog is a 100% digitization: the customer does the work and the order is 100% taken over by a services. Digital Tansformation - is the transformation of classsical business processes into digital services. This can be done with agile or traditional methods. Agility - is the way in which digital business processes are identified, designed and build into digital services. 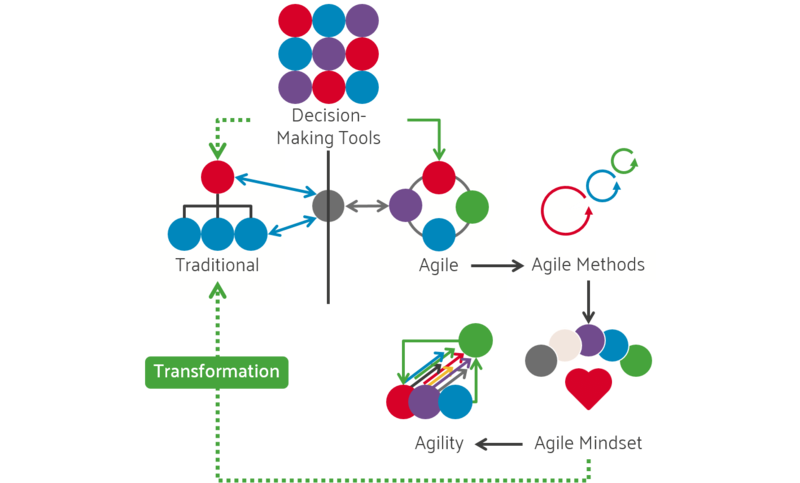 Agile Transformation - is a change process that enables people to work together in a self-organized and self-responsible way at eye level. This form is superior to traditional methods. The Change itself, agile and digital transforamtion succeed best with decision-making processes and agile methods. Agile methods, such as Scrum, are an extremely disciplined approach to successfully implementing projects. The core of any agile method is time-boxing and single-tasking. Time-Boxing - Smallest possible units (stories) are processed in fixed time units (sprints) in order to work iteratively with timely feedback. Here one orients oneself towards human behaviour, which is also organised in time boxes, such as hours, morning and afternoon, days and weeks. Time-Boxing turns a classic procedure on its head that plans in phases of different lengths. The belief in a perfect plan is replaced by quick feedback on the effect of decisions and actions. A compulsive final achievement of goals is abandoned and replaced by consistent continuous development and improvement. Values are a behavioral description. If someone communicates openly or the backlog and protocols are openly accessible, the value of openness or transparency is lived. Agile methods fundamentally renewed the understanding of initiatives and plans and consequently the interaction with all project staff. This resulted in a stable behavior (values) within the agile team and with the product owner. Agile methods replace a traditional authoritarian understanding of leadership with an appreciative cooperation at eye level. Between the artefacts there are transitions that required commitments between roles and within the team. The roles and artefacts regulated tasks and results in an open manner as well as a secure framework for single-tasking. 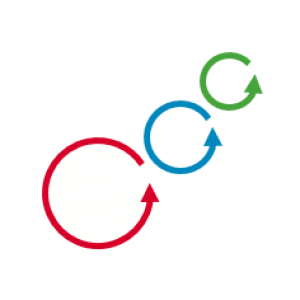 Time-Boxing gave the agile team the focus and the Ceromonies an open exchange of information, in which also a critical and courageous exchange became possible. Cross-functionality in the team allowed self-organization in order to achieve the goal in self-responsibility. The values are rooted in the values of self-organization and self-responsibility which lead to the goal ownership. Of course, other agile methods and experiences also create agile values. However, from the point of view of the inseparability of emotions, intuition and cognition, one can safely deduce that values develop from successful experiences. Even if one can make these experiences on different ways, then this "natural way" guarantees the agile Mindset. If agile methods are successfully introduced and lived, the agile mindset will continue to develop. In companies, pioneers often opted for agile methods in selected areas. This created a critical position (product owner) between the divisions. The different needs and the contradictory approach between the agile and traditional world must be brought together here. With secure decision-making processes, the product owner can elegantly solve this breaking point. Agile areas must be protected from the influence of traditional areas. 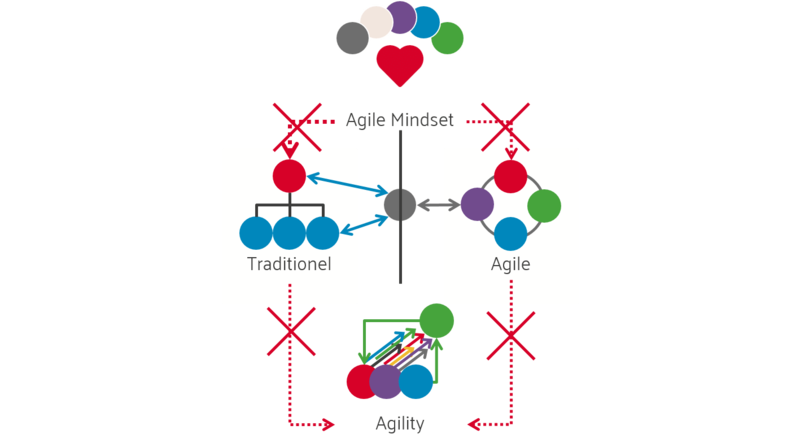 Managers have never really captured the agile concept, according to Rigby, Sutherland, Takeuchi in Harvard Business Manager 4/2017. Thus, transformation is often obstructed with good intent. Even employees do not have sufficient know-how about agile methods, according to the Hans Böckler Foundation 2017. This area of tension often hinders agile change considerably. Of course, this situation will resolve itself with the expansion of agile methods. However, there is a danger that by then they will be devalued and weakened. A sure way is to have decision-making processes that avoid these risks. The greatest obstacle is always stated to be that the prevailing corporate culture does not fit. In fact, the values and the culture does not fit the agile mindset, as it has emerged from traditional areas with the values of leadership and control. to introduce the transformation as a top-down process, if desired. This is also the reason for further difficulties: Poor cooperation, inability to prioritize and commit, general communication problems, lack of agility and management support. These difficulties can be cured in retrospect as well as taken into account during agile transformation. A missing commitment process that reliably creates commitments prevents or destroys an already developed mindset because experiences that form the agile mindset for all parties fail. The commitment process thus becomes the central decision-making process. In order for the transformation to be successful, it requires a mandate, repeated commitments and the involvement of management. 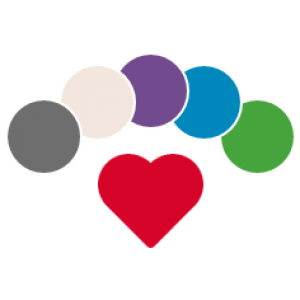 The introduction of jointly supported decision processes with an accepted evaluation, a quality, commitment and prioritization process would create the solid foundation for a change. Some companies try to use the advantages of agility without introducing decision processes and agile methods in the traditional areas. For this purpose, they try to introduce the agile mindset or the inner attitude with various transformation processes in companies, which can only succeed to a limited extent. In fact, companies need open, focused and courageous cooperation at eye level based on reliable commitments. From this perspective, companies are primarily concerned with changing people's behavior. The transformation of the inner attitude can only be achieved with successful experiences. Other paths initially achieve positive effects, which are, however, regressed by the normative effects in the company. They are a wonderful approach for the opening of the people involved, but not sufficiently effective for the robust anchoring of agility. The failure of 70% of agile transformations shows that agile Mindset can only be achieved to a limited extent. The agile tranformation is a complex and fragile process. A sustainable change requires attentiveness and an excellent change design, followed by consistent implementation and supported by decison-making processes. To show how the agile mindset develops with agile methods, Scrum is chosen here. The regular ceremonies, artefacts and clear roles encourage the development of the agile mindset by all involved. Repeated successful experiences in fixed ceremonies are a reliable way to develop the agile mindset with all participants. In retrospective, the team can live openness, focus, eye level, courage and commitment in a protected space. In the Sprint Review, the agile team and the product owner receive appreciation for their performance and can continuously develop from the feedback. Ceremonies are rituals that develop personal skills and values due to the inseparability of emotions, intuition and cognition. However, already the risk becomes visible, namely when the ceremonies, artefacts and roles are not successfully applied, the devaluation and the loss of the agile mindset begins. This can be counteracted with jointly supported decision-making processes. Culture only emerges when people behave consistently according to values that are experienced in successful decision-making processes. Values such as openness, focus, eye level, courage and commitment should not be prescribed, nor should they be demanded. They arise when they are embedded in accepted processes and applied. A commitment process is also a mandatory prerequisite for this. Decision-making processes thus bring people back to the centre, precisely because they involve each individual in his or her diversity in a secure and open order. Accordingly, a cultural change is then set in motion for each individual, in traditional areas as well as in agile teams.